When I posted this article on Why people don't like to watch news videos on the don't get caught Facebook page, I wasn't prepared for the highly enthusiastic reaction it would get. Communications pros and followers of the page chimed in, supporting with their own experience: Reading beats watching news videos. Hands down, it's cited as more convenient and quicker. 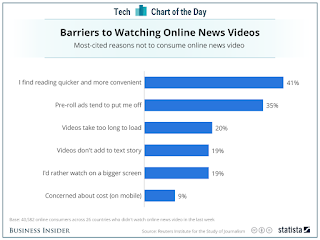 A recent poll of 50,000 online users conducted by the Reuters Institute for the Study of Journalism found that only 24% of people had watched any news videos online in the last week. 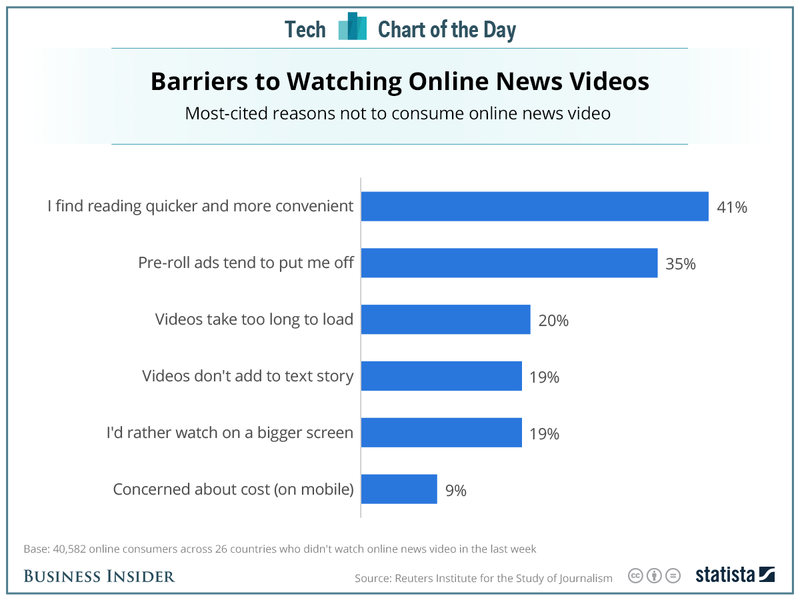 This chart from Statista shows the reasons why people say they don't watch news videos online. The number one reason: reading is faster and more convenient. Basically, the video itself was seen as a barrier to getting the news quickly. At the same time, we've all had a graphic demonstration of the power of livestream video to share news as it happens. Livestreaming of the aftermath of the police shooting of Philando Castile by his girlfriend has caused a furor. It also prompted many users active on black Twitter (you did know there's black Twitter, right?) to vow to start using livestream services such as Facebook Live and Periscope. For activists and others, livestream video takes down a barrier and widens their audience. In the case of violence in particular, Facebook decides whether to remove a post depending on whether it seems to celebrate or glorify violence or whether it condemns it or bears witness to it to spread awareness. In the latter case, it will allow the video to continue to stream, but will add a warning to it and the video won't auto-play or be visible to users who are under 18. Some are saying that these livestreams, with audiences that come close to rivaling the network TV news broadcasts, are removing incentive to watch television's last stand, the live event. Again, it's removing a barrier and broadening access. When you're choosing whether to use video, and which kind of video to use, you might benefit from framing the choice in terms of barriers. Ask: In posting this, am I creating any barriers to watching my news video, like omitting text and a transcript? Or failing to include sharing and embedding tools? Or forcing users to watch on just one platform? If your video posting or livestream will eliminate a barrier, perhaps that's its reason for being, as members of Congress found out during their recent sit-in. Let me also note that we need all types of video: explainers, parodies, paint drying, everyday news, how-tos, and horrific acts in progress. There is no one-size-fits-all on social media, folks. Despite that, some news organizations, like Tribune Publishing, are going for bulk and automating their news video operations--with a goal of issuing 2,000 videos per day. That's a lot of incoming, people. The Reuters Institute study is summarized in the video below--but you can find the full report here, text lovers. It has a wealth of trend info on digital news consumption of all kinds, including news avoidance in the digital world, the continued preference for personal recommendations, and more. If anything, the report--and recent events--are just a reminder that there are no magic bullets when it comes to online content and that news value and content still matter.